As my passion for sharks expanded when I was younger, so did my knowledge that The Netherlands is not particularly known for its high elasmobranch abundance and diversity in its European continental waters. We do, however, have some smaller elasmobranchs like the small-spotted catshark (Scyliorhinus canicula), spiny dogfish (Squalus acanthias), starry smooth-hound (Mustelus asterias) and the thornback ray (Raja clavata), but sightings by divers are rare. A much rarer visitor to the Southern part of the North Sea is the enormous basking shark (Cetorhinus maximus) and there is some anecdotal evidence that the predatory porbeagle shark (Lamna nasus) enters the Dutch EEZ (Exclusive Economic Zone) on rare occasions. However, the Kingdom of The Netherlands is not only ‘The Netherlands’ in Northwestern part of Europe, but the Kingdom also consists of the Dutch Antilles in the Caribbean. I am not going to burn my fingers on trying to explain you the complexity of our Kingdom, but most important is the fact that there are 6 Caribbean Islands part of the Kingdom of The Netherlands along with the EEZ of each island. A country has the rights to exploit all the resources within its EEZ, but is also responsible for conserving its natural resources. This makes an unique situation: large predatory sharks in Dutch waters across the Atlantic Ocean. Since a lot of the sharks in the waters of the Dutch Caribbean EEZ are threatened with extinction due to overexploitation in combination with their k-selected life history traits (e.g. slow growth, late maturity, etc. ), I was very happy to read that the Dutch government announced on September 2nd that the EEZ around Bonaire and Saba will become shark sanctuaries. Unfortunately, as sanctuaries are a major step in the right direction, they do not grant full protection for migratory species or species with large home ranges. Marine life migrates independently from boundaries set by governments, meaning that sharks might be protected in the waters of one country, but the sharks are targeted once the cross the border of another country during their migration (e.g. white sharks are protected in South Africa, but not in Mozambique as they migrate up the Eastern coast of Africa). This means that sharks (and all other marine life of migratory nature) are only fully protected by an interconnected network of protected waters that circumvents their home range or migratory routes. Theoretically this means that the sharks around Saba island are only fully protected if they stay within the island’s EEZ. In October 2014 the Dutch research institute of IMARES in collaboration with the Saba Conservation Foundation tagged 12 sharks – 8 Caribbean reef sharks (Carcharhinus perezi) and 4 nurse sharks (Ginglymostoma cirratum) – with acoustic transmitters as part of the Save Our Sharks project generously supported by the Dutch World Wildlife Fund (WNF) and the Dutch Ministry of Economic Affairs. Now this tagging study is continued, supported by the Dutch Postcode Lottery. As part of my first Master Thesis for Wageningen University, I am going to analyze the first-ever acoustic telemetry data of sharks in the Dutch Caribbean to discover the spatiotemporal use of Saba by the two focal species. In addition, we are conducting a short field expedition (11 October – 1 December) to retrieve this data from the acoustic receivers, tag 12 more sharks on the Saba Bank and place more acoustic receivers around St. Maarten, St. Eustatius and on the Saba Bank. The outcome of this study can be used to evaluate if the sharks mainly occupy the waters of Saba, or that the venture possibly outside the boundaries of protection, highlighting the importance of an interconnected network of protected areas for these animals. Sharks fulfill the essential role of apex predator in various marine ecosystems. Loss of shark biomass has been linked to algae overgrowth of coral reefs. Sharks target the weak, meaning that they keep (commercial) fish populations healthy by eliminating possible disease carrying fish. 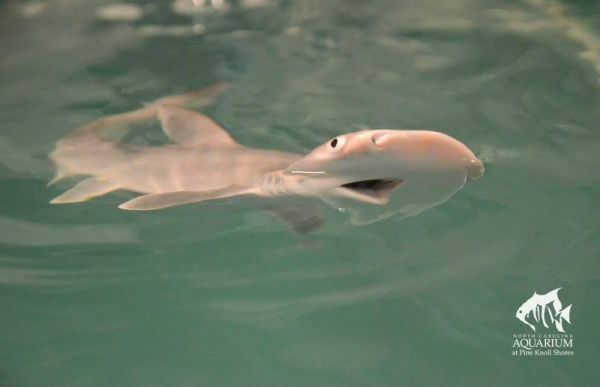 Sharks can be extremely cute too… (which in all honesty, should never be the main drive to conserve a species). Please keep an eye on this page for field updates and if you would like to have a more regular update, consider following me on Instagram and Facebook. Next: Next post: Statia: ready to track sharks!